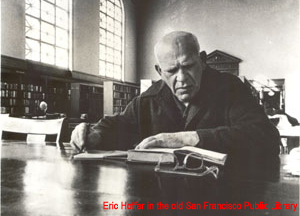 The Eric Hoffer Award is dedicated to the memory of the great American philosopher and freethinker Eric Hoffer. Registration Guidelines: For each nomination, submit the book, registration form, and $55 fee (chapbooks $40) by check, money order, or Internet payment receipt to Hopewell Publications, PO Box 11, Titusville, NJ 08560. Be certain to specify the book category and press designation. Registration will be confirmed via e-mail. Submissions must be postmarked by January 21st of the award year. (E-book entrants can complete their registration by following our e-book entry instructions.) The Eric Hoffer Award occurs annually and is open to academic, independent, small press, and self-published books that were released or copyrighted in the last 2 years. (Books over 2 years enter the Legacy Fiction or Legacy Nonfiction category.) Yes, you may nominate your own book. One grand prize will be awarded for the entire contest. In addition, each category will be awarded a winner, runner-up, and multiple honorable mentions. Individual press awards will also be awarded. Registration automatically qualifies the book for Montaigne Medal, da Vinci Eye, and First Horizon consideration. Judges may include authors, editors, agents, publishers, librarians, artists, experienced category readers, and health and business professionals. All entrants will be notified of winners, after April 30th of the award year. After the contest, printed books will be donated to libraries, schools, and hospitals where appropriate, which are fine places to promote your book! Note: Contest closed to Hopewell Publications staff and previous Eric Hoffer Award winning book entries. At the low nomination fee, it is not feasible to provide judge’s critiques for each entry.